What is the most important keyword in 2019? For Search Engine marketers, the most important keyword is intent. Google’s improved ability to recognize intent is changing the landscape of SEO strategy in 2019. Intent includes both keyword intent and user intent. In the ongoing struggle to provide the best user experience, search engines, like Google, are always trying to improve the relevancy of their search results. The ongoing goal is to provide results that best answer the user’s search queries. With ongoing changes to their algorithms, improved recognition of intent, and real-time filtering, search engines are poised to make old hat spammy SEO tactics ineffective, to create a better user experience. Officially founded in 1998, Google is 18 years old and leaving its adolescence. With its age, learning, and evolution, Google is getting harder to trick. Over the years, we have seen many SEO techniques fall out of favour as a result of improvements to Google’s algorithm and program changes. The past years have seen a trend of Google getting better and faster at discrediting SEO techniques that are not beneficial to the user experience. In the past year, Google has made over 500 algorithm changes, as well as implementing real-time filtering. As a result, it is no longer practical for search engine marketers to try and game the system. Instead, a successful search engine marketing strategy will work in parallel to search engines. How does Pedestal run an SEO strategy that works with search engines like Google? We take a look not just at the individual changes that search engines are making, but at the overall paradigm shift, these changes represent. The quality & user experience value of the content – Content that answers search intent. In both cases, there are many influencing factors, but intent is the core value. We have been hearing for years about the growth in users accessing content by mobile, with 60% of searches occurring on mobile. While this trend is still seeing an upward climb and is projected to continue, mobile is only part of the picture in how users are accessing content. The inherent value of long tailed keywords is already known amongst both SEO and PPC marketing teams. They are easier to rank and compete on because they are more specific, and that specificity means they are more relevant to the user – and therefore more likely to be clicked on and read. It has been estimated that as much as 75% of search queries are long tail today. In recent years, there has been some discrediting of long tail in SEO because it has been suggested that Google does not treat long tail as exact match. However, a long tail keyword, even if it’s not being exact matched, still reduces competition and opens up more opportunities to rank in related long tail searches. The rising popularity of voice search has been a major influence in the growth of long tailed search. Voice search accounts for 15% of all search traffic, with the majority of voice searchers having started using this feature in the past year and more are joining every day. With voice recognition having drastically improved, this trend is likely to continue growing. Users of voice search are using full sentences to search, and are largely responsible for the boom in long tail keywords. As this becomes the trend grows, the value of long-tailed SEO is sure to be reflected in search engine ranking. The launch of Google Assistant, Google’s new voice search will likely mean this becomes even more important. We have written about the importance and value of local search in its ability to help local and small businesses. Local SEO in 2019 is no longer just the way for small businesses to compete, it will be a crucial element to any brick and mortar business’ SEO strategy. Much like long tail, the primary reasons for the surge of importance in local are user intent and mobile usage. 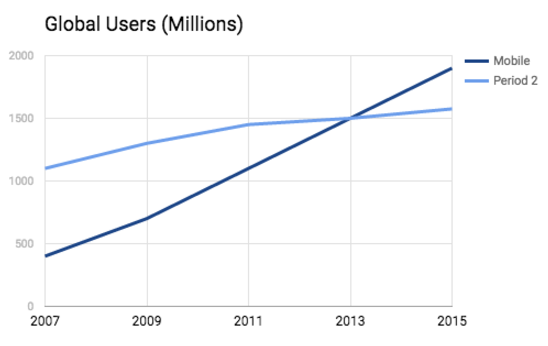 As mentioned earlier, mobile usage has surpassed desktop. Combine this with the fact that mobile searches show local intent, and we end up with the increased value in local SEO. Local SEO has grown on desktop as well, with 50% of all searches (desktop and mobile) being performed with the intention of finding local results. The intent is proven by real, in-store results. Local searches lead to same day in-store visits over 50% of the time. As a result of users searching with local intent, search engines, like google, are better rewarding SEO content that uses local keywords and search intent. Search beyond city limits. Prior to the Possum update, it was difficult for businesses outside of city limits to rank on search terms including city names. With the update businesses just outside the city limits are no longer stranded on local search terms. Ongoing mobile growth has been touted for years. While it may seem like old news, it can hardly be ignored, as the trend in increased mobile usage continues. Optimizing for mobile in 2019 isn’t just about increased mobile usage, it’s about a shift in the content mobile users are seeking. In the past, mobile was all about keeping things easy to digest, click, and share. Now we have mobile users who are seeking out and reading articles on mobile. vTo be found by mobile users, Google favours websites that are optimized for mobile – basically, to get ranked for mobile, Google needs to be able to read a site for mobile. The importance of optimizing for mobile is going even further in 2019, and here’s why: Google will be indexing mobile and desktop separately! This gives an opportunity to outperform anyone on mobile who isn’t staying up to date – or vice versa. Currently, successful desktop SEO may see a drop due to mobile performance. The short and sweet of it is, by now you’ve been hearing for years that you should optimize for mobile, but in 2019 mobile optimization will be a necessity. Mixed content will be leading the SEO charge in 2019. Videos and images, in addition to SEO optimized text, will be crucial in gaining and maintaining top ranking content in the coming year. In 2016 we found that users are looking for video content more than ever before. Searches for videos have grown faster than any other search medium in the past year. Today, 62% of Google Searches are for videos, with Youtube videos dominating the category. Video content ranks 50x better organically than plain text, and their CTR is 41% higher. Blended content is not limited to video. Images and infographics are still important factors affecting rank, click thru rate, and onsite user experience. Visual content makes your page more appealing to readers and thereby gets treated favourably by search engines. They also offer more opportunities for technical SEO and are shareable content that can help for linkbuilding – especially for unique content. Unique videos, images, and infographics are both more likely to be shared and appear to rank better. Many search engine marketers dismissed the SEO value of social media years ago. For many, 2016 saw a 180° shift in opinion, as search engines began to index Facebook & Social Media. As more social media posts are being indexed, as they continue to be indexed more frequently in 2019, they will become an important aspect of many SEO specialists’ strategies. However, although more social media posts are going to be indexed in 2019, it will be far from the majority. For the coming year, the best use of this will be when focusing on branding. Leveraging social media indexing for branding can help to establish your brand’s presence on the first page. 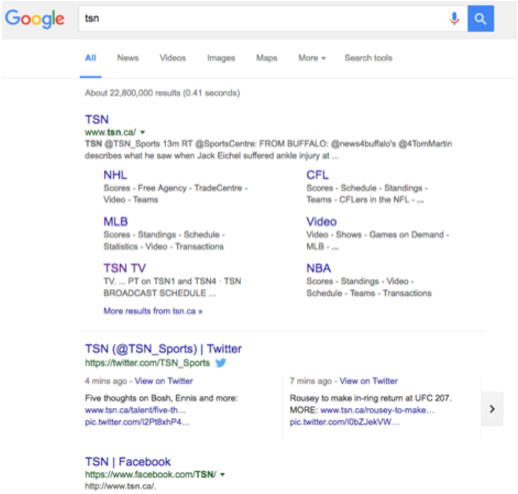 In the example above, TSN (a Toronto sports media company) has taken over the entire visible search page by leveraging their Twitter and Facebook accounts. How do you get your social media content indexed? To increase your chances of search engines indexing your content, they need to understand what the content is and what terms it should be ranking on. The best way to accomplish this is to create links from your site to social media profiles and content you are hoping to get indexed. Penguin was first released in 2012, aimed at detecting sites using spamming and black hat SEO tactics that are not captured by Google’s regular spamming detection. The objective of penguin is to help Google reward high-quality websites. Penguin 4.0 has been released, and it is the final version of Penguin. In the past, Penguin has run periodically, filtering for spammy content. If a site was caught using tactics Penguin didn’t like they would be penalized by Google. Sites could fix the issue, but wouldn’t be freed from their penalization until the next time Penguin ran. Unfortunately, this wait could take months or more – the last Penguin update was released in October 2014, so some sites had to wait nearly 2 years to be released! This is part of why this “final version” of Penguin is so important. Penguin will now be running in real-time. As Google continuously crawls websites, Penguin will filter at the same time. This means sites can be released from penalization much sooner. On the other hand, it also means that sites using spammy tactics will be caught much faster. Some of the other changes with Penguin 4.0 include a more granular approach. Penguin will not necessarily penalize an entire site, it may just penalize single pages or sections at a time. Being called the “final version” is a bit of a misnomer. While it is the last official release, now that it will be filtering in real-time, Penguin will continue to be updated. However, Google will no longer be announcing Penguin updates. In 2019 Penguin will help Google become more adept at rewarding high-quality SEO content. Quality has been incorporated into Google’s search algorithm. This was accomplished by making Google Panda a core ranking signal for Google. In earlier iterations, Panda ran independently from the main Google algorithm. Panda’s purpose was to measure the quality of a site. The latest iteration, Panda 4.2, has been included in Google’s main algorithm. The algorithm now takes panda’s quality measurement into account when ranking sites. Panda 4.2 was actually released back in 2015, but it has been rolled out slowly. 2019 will be the first full year it is truly in effect. Unlike previous versions, Panda 4.2 will be a continuous update. It is not real-time, like Penguin, it is an ongoing cycle, but it could still be weeks or months before a site is cycled again. Just four years ago, SEO experts would advise writing 500-word posts if you wanted to rank. Since 2012, that number has more than double, with 1200-1500 word posts recommended. For more competitive terms, some experts will suggest even longer. 1. Matching user habits; 2. Matching user intent. Users today are reading longer articles than they did in the past, even on mobile. While information should still be made easy to digest, and paragraphs kept short to improve readability, longer articles have many advantages for content creators and content consumers. Longer content is given more credence. Readers see long form content as more authoritative and informed. Not is the modern audience willing to read long form, they also are more likely to share or link it on social media, because it adds more weight to their own voice. For these same reasons, long form SEO is more likely to be cited than short form, generating more backlink opportunities. Content aggregation will be a major factor in 2019 SEO strategy. Users are looking to find all their info in one place – hence the popularity of the single page website (the bane of the SEO marketers existence). Users want to find content that fully answers their search query, with full, in-depth, intent-satisfying answers. Google’s improved ability to recognize intent is perfect for long-form SEO content. Longer content pieces will allow you to rank on more potential keywords and search terms. By recognizing this, Google can better match your content to search intent, so you can rank higher on more relevant searches. Featured snippets are designed for a better search experience. They offer users a better search experience by giving a direct answer to search queries. Google gives top search position to a snippet from a post which answers the query in under 50 words. This helps the user get an answer right away. It encourages SEO specialists to make useful content that answers user intent. The top position received by featured snippets is referred to as position zero. It is called position zero because it appears before the first position post on Google. Some content producers are concerned that giving the answer in a featured snippet will reduce click thru rates. This effect can be turned around by having more information available for those who click the article. Use the immediate answer to entice the user to learn more. Link-building remains a powerful search engine ranking technique. Inbound links remain a core Google ranking signal for Google. They make your site appear more valuable and authoritative. As a result, inbound links improve your SERP. Still, be careful with your link-building strategy. In the future of link building we discuss Google’s improving ability to identify and penalize spam link-building techniques. This incorporated the implementation of Google Penguin, which was able to differentiate between the quality of sites. Lots of low quality inbound links was an indicator of spam. The result of this is an existing mentality around building links for SEO. The goal was to get links from websites with a high domain authority. But, a high-quality inbound link isn’t just about domain authority. In the nature of making everything about user intent, a high-quality link is all about relevance. It is better to have links from a lower domain authority site with relevant content and anchor text, than a less relevant link from a site with high domain authority. 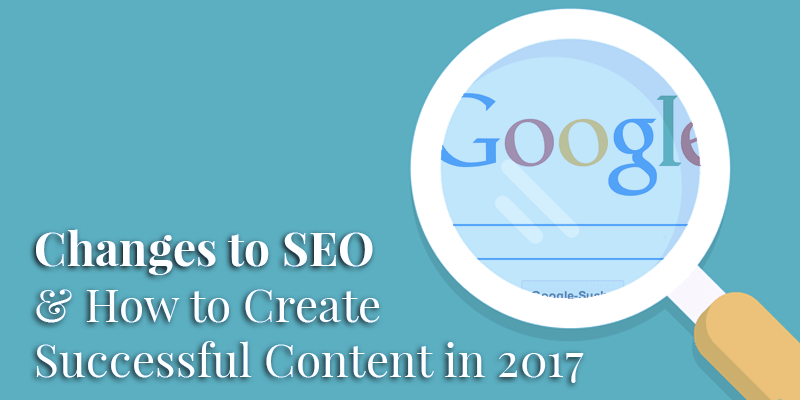 In 2019, effective SEO content will need to shift from focusing on search engines to focusing on the intended reader. While the approach to SEO will change for many marketers, the value and overall goals will remain. To get your business on the best path to SEO success in 2019, contact Pedestal today.